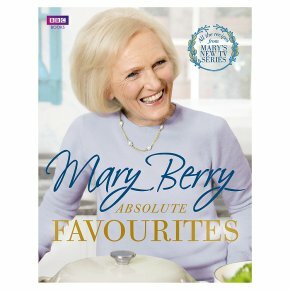 In this official tie-in to Mary's gorgeous new six-part BBC Two TV series, Mary reveals the secrets of her very favourite food. Featuring all the foolproof recipes from the show, Mary introduces you to her favourite dishes using produce from the farmers' market, the herb garden, the seaside, the countryside and more. This all-new collection of over 100 fuss-free, delicious dishes offers yet more inspirational ideas that anyone can try. From temptingMini Beef Wellingtons, perfect for a party, to her foolproof Saturday Night Pasta, Mary's no-nonsense advice means cooking for friends and family has never been simpler. And of course, there are plenty of indulgent cakes and teatime treats for those with a sweet tooth. The book also contains Mary's favourite Christmas recipes, from the two Mary Berry's Absolute Christmas Favourites TV specials. These are dishes that Mary never tires of, that are not too difficult to make, that don't have too many ingredients, and that'll have all your family asking for second helpings! From tempting canap?s and inspiring salads to comforting suppers and indulgent cakes, it's never been easier to find a new absolute favourite.